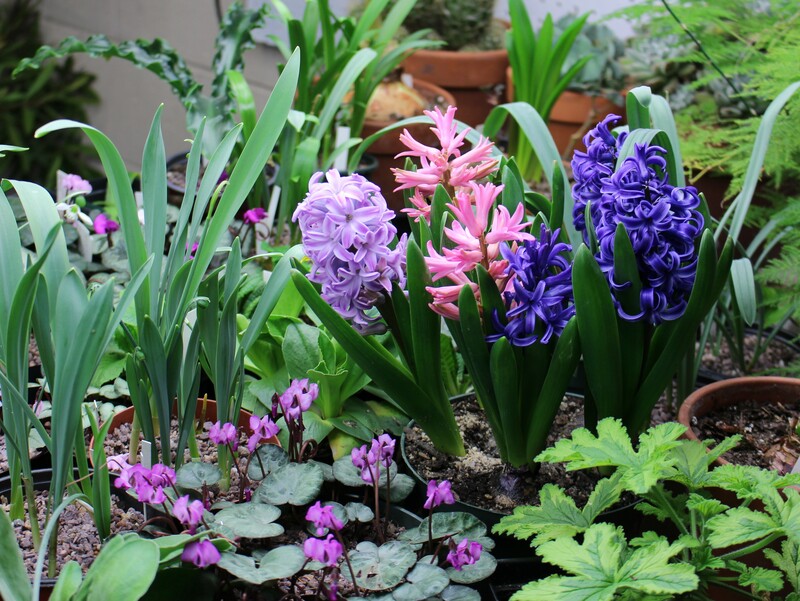 The last few weeks have me drowning in the color of spring bulbs. 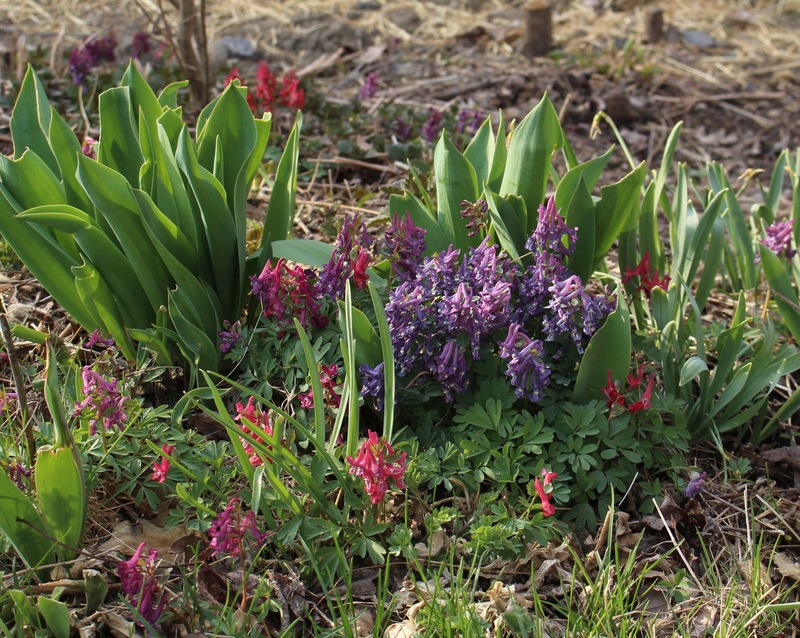 They’re not the fanciest varieties and they’re not laid out into the most exquisite vignettes, but they are bright and to me they’re just about the nicest explosion of spring that I could imagine. 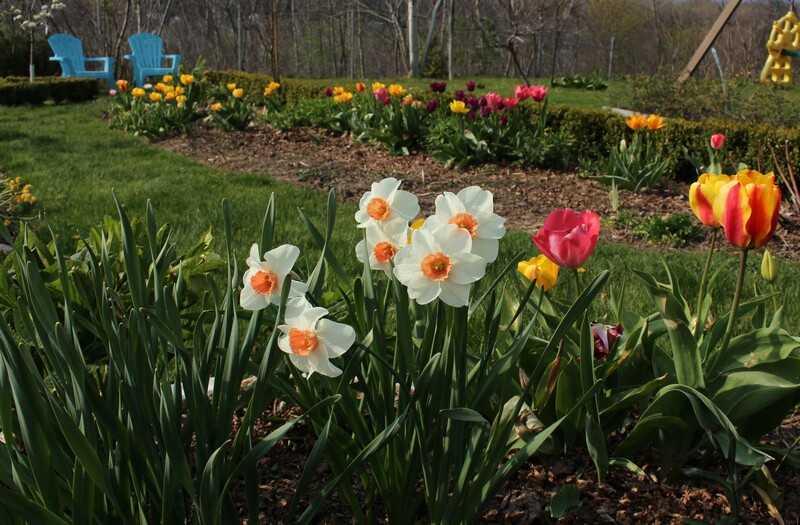 Perennial Darwin tulips in the vegetable garden. I keep threatening to evict them in order to make room for tomatoes, but tomatoes can wait and for now this is something you just can’t buy at the grocery. *photo credits to my wife for this one. 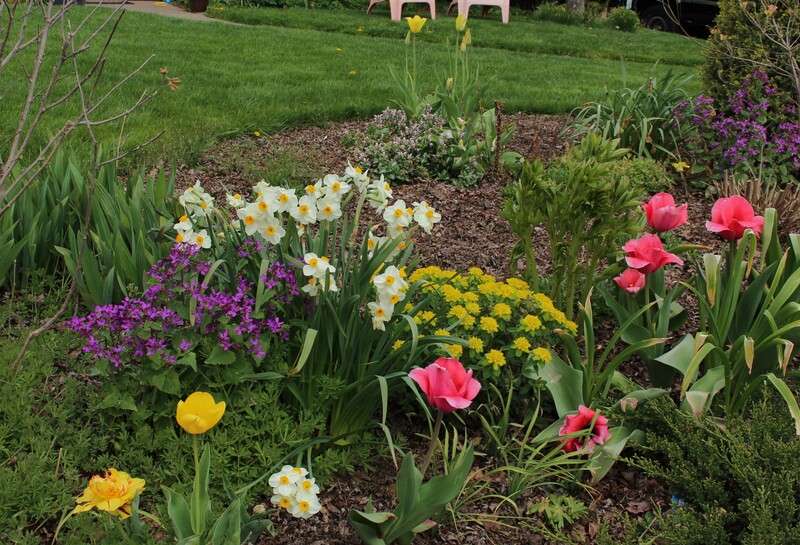 The spring color lured her out as well… in spite of allergies! 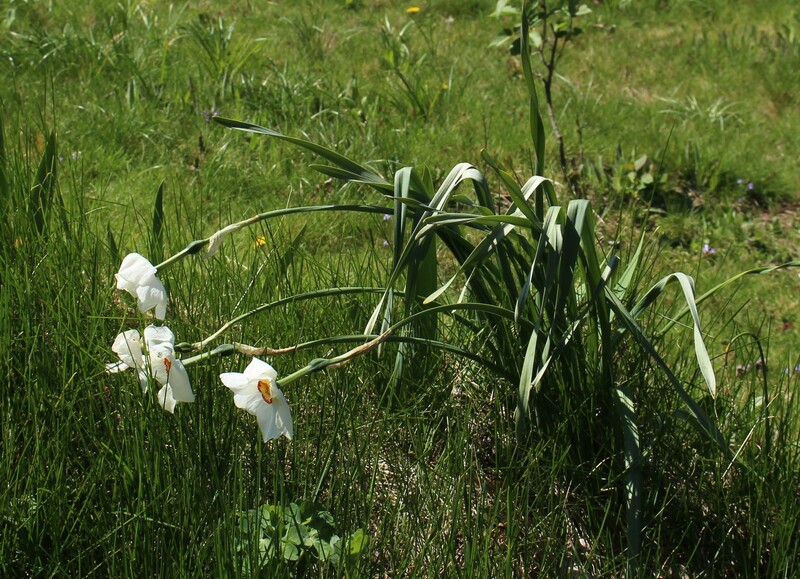 Every summer I make an attempt to reclaim the vegetable garden and every spring it seems like the bulbs are multiplying faster than I can dig. 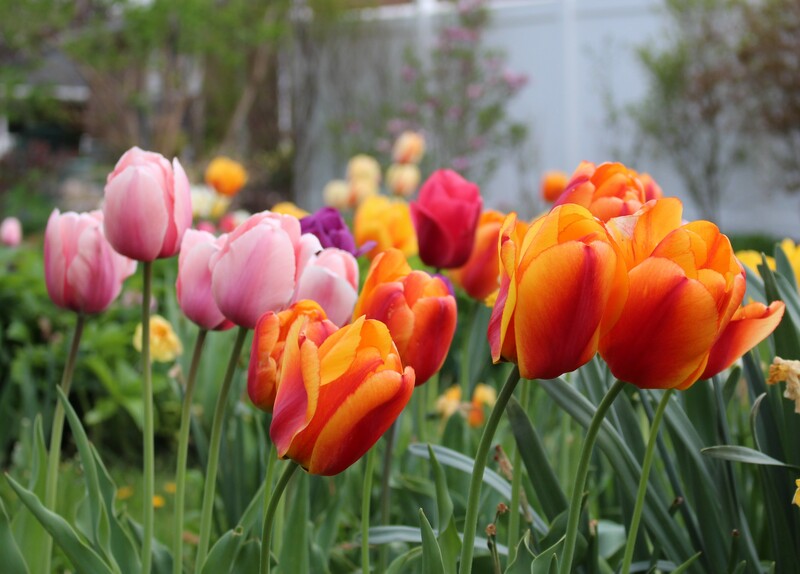 The daffodils are carefree, but even the tulips make a go at it, and I think the summer baking in thin, heavy soil is really what they seem to enjoy. If only the vegetables did as well. The area more commonly known as the “Potager”. To put minds at rest I’d like to proudly announce that the center bed actually now contains vegetables as well as a few blooms. The seed potatoes finally went in this week. 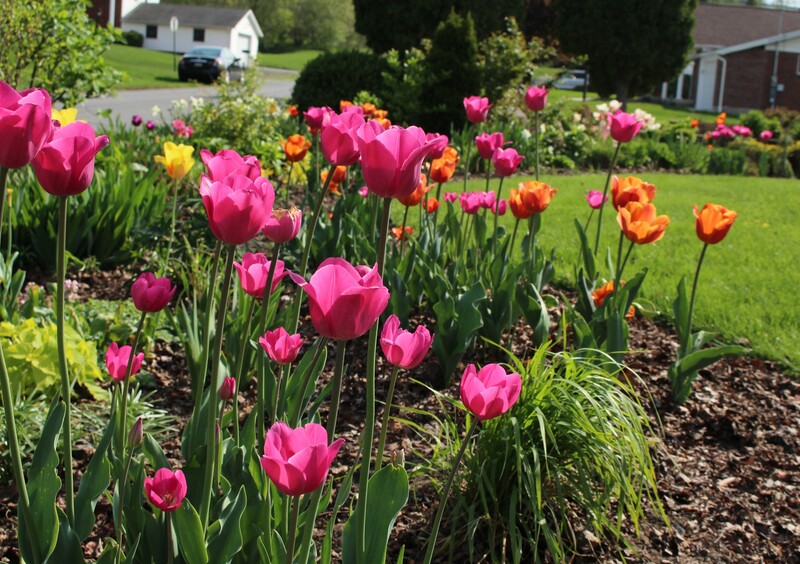 Not to paint myself as some greedy, plant hording ogre but here are the tulips which were supposed to end up next door in my brother in law’s yard. At the time it sounded like an extremely noble gesture, this selfless donation of extremely fat tulips to someone else’s garden… but then I had second thoughts and into my own garden they went. Looks like my petition for sainthood will still face a few bumps in the road. 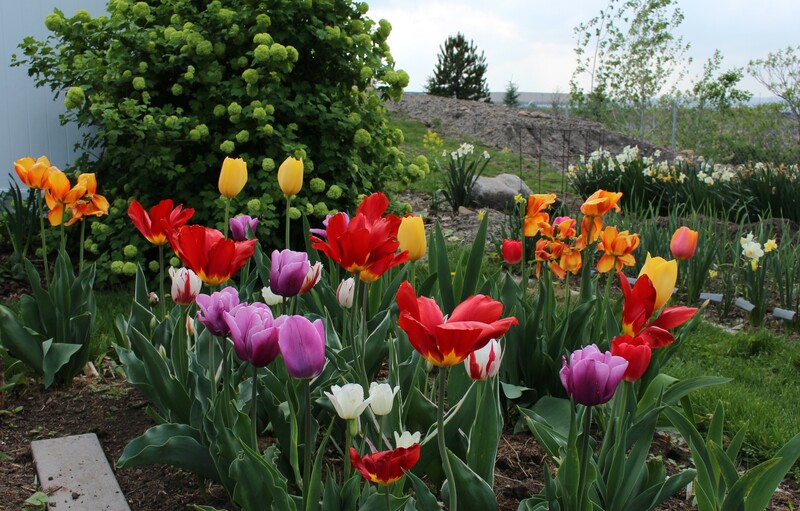 The orange tulips were already here, but the purples, reds and whites were newly planted from a bag of ‘mixed Darwin tulips’. 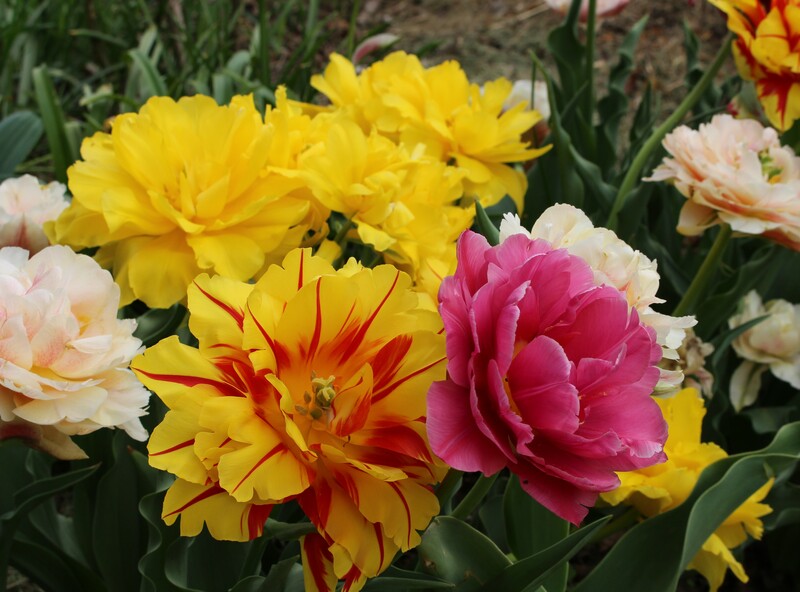 They’re nice enough, but as it is with these mixed bags from a big box store they’re not Darwin tulips, and they’re nothing like the photo on the bag. They are colorful though. 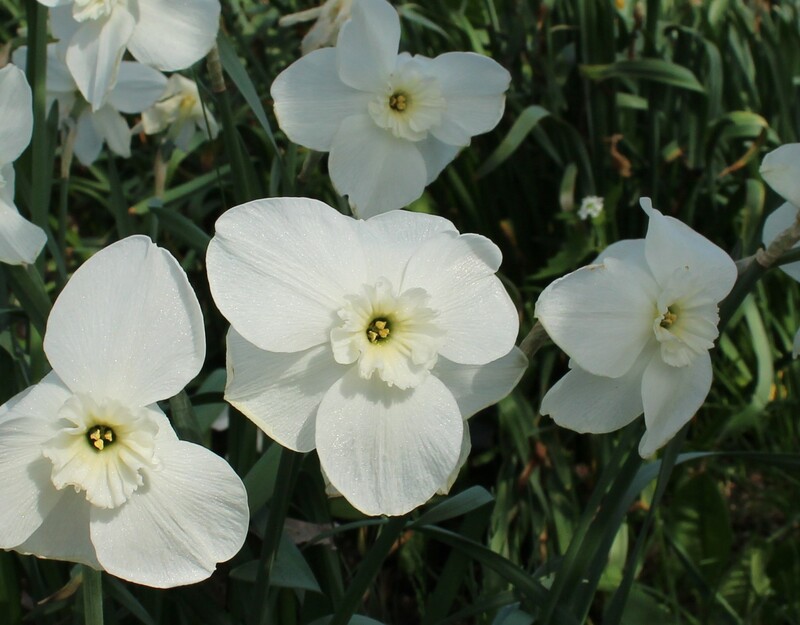 The beautifully pristine narcissus ‘Bright Angel’. 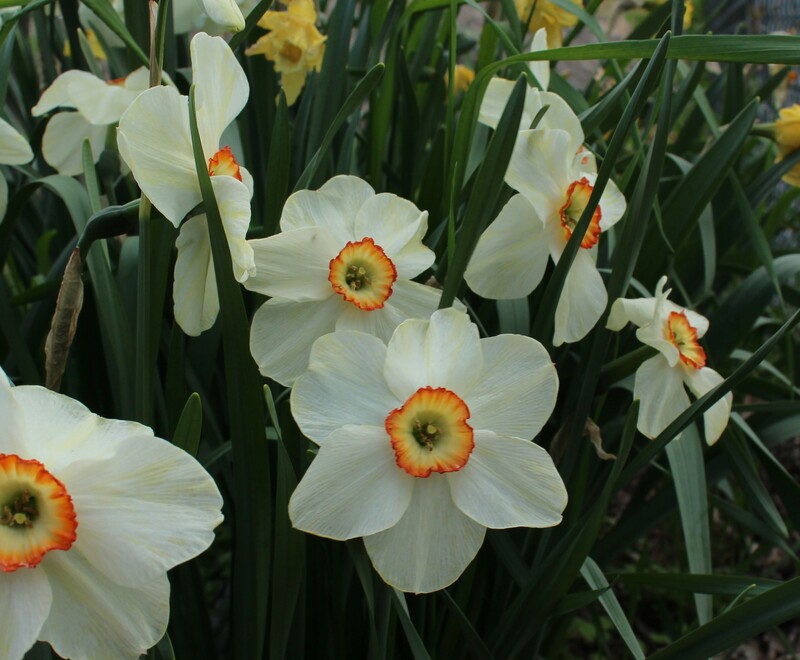 The early and midseason daffodils may be over but these are still just perfect! 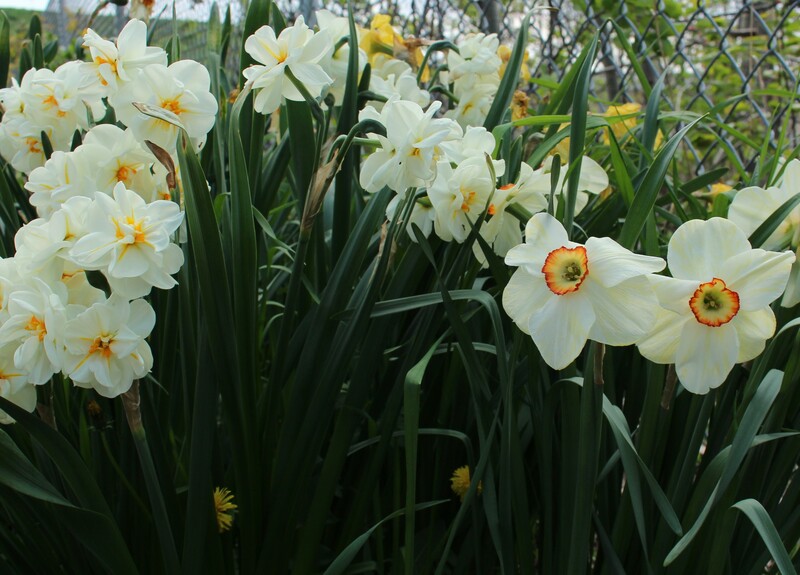 While the tulips are taking the spotlight there are still plenty of daffodils. This is the tail end of the season, and the late varieties are really welcome as the others begin to fade. 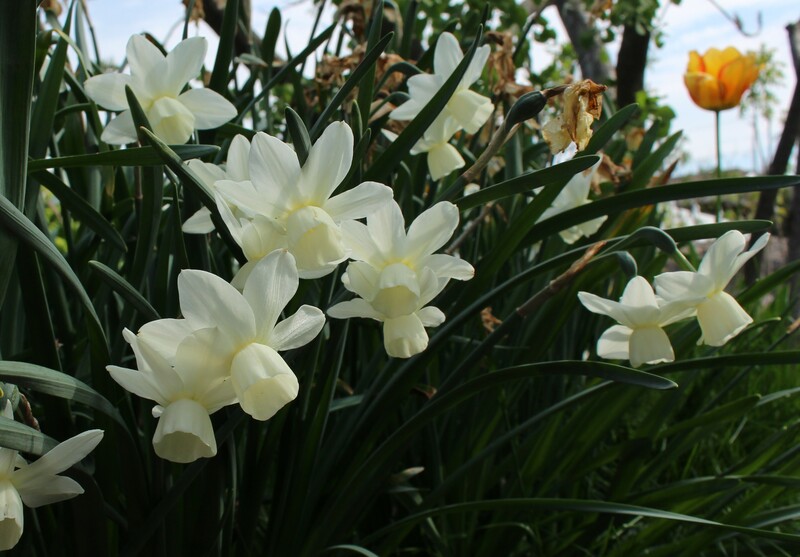 Narcissus ‘Irish Linen’. A clean, pure beauty which has stood up well to the wind and changing weather. For this little slice of Pennsylvania 2017 has been an excellent daffodil season. 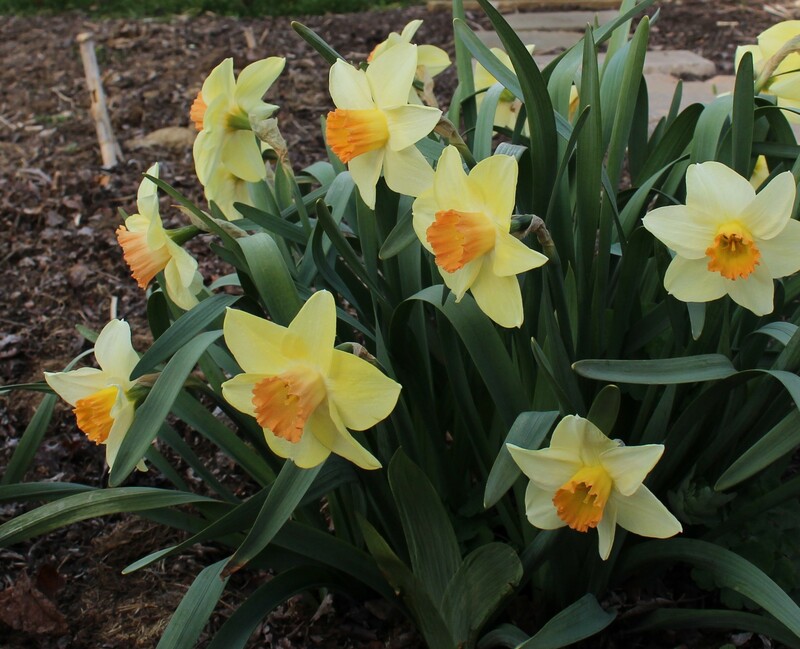 Occasional rain, reasonable temperatures and no brutal freezes have reminded me that these bulbs can be overwhelmingly awesome, and I’m almost ashamed to admit I considered entering a few flowers into a daffodil show. What kind of fanatics do things like this!? The closest would have been a two hour drive each way and me being a complete novice I just couldn’t rationalize my way into it. 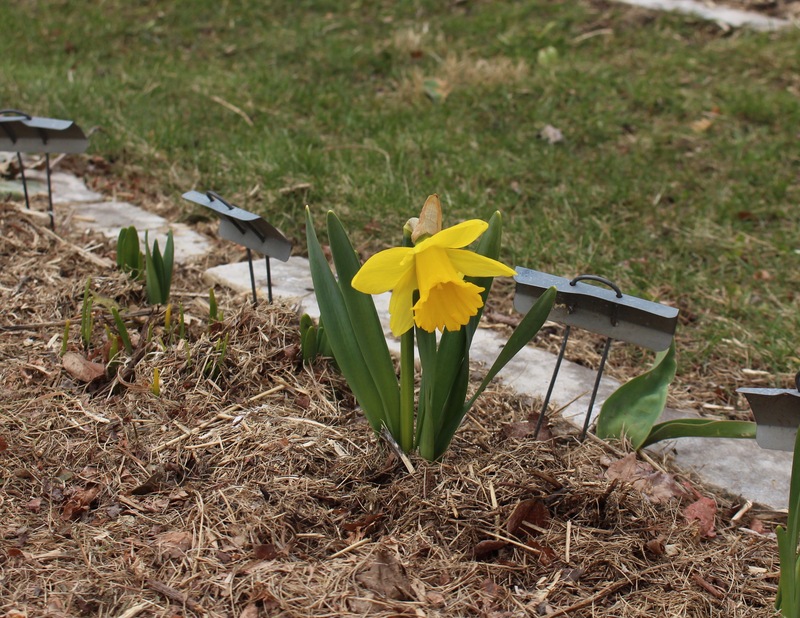 For now maybe I’ll just rejoin the American Daffodil Society and consider a try in 2018… that sounds entirely reasonable. The fragrant double ‘Sir Winston Churchill’ on the left with ‘Requiem’ to the right. Both deserve more recognition than that of a passing rabbit or lone, wandering gardener. ‘Requiem’ again. The Petals have a lemony flush to them which I love, and the small cup looks so perfect. 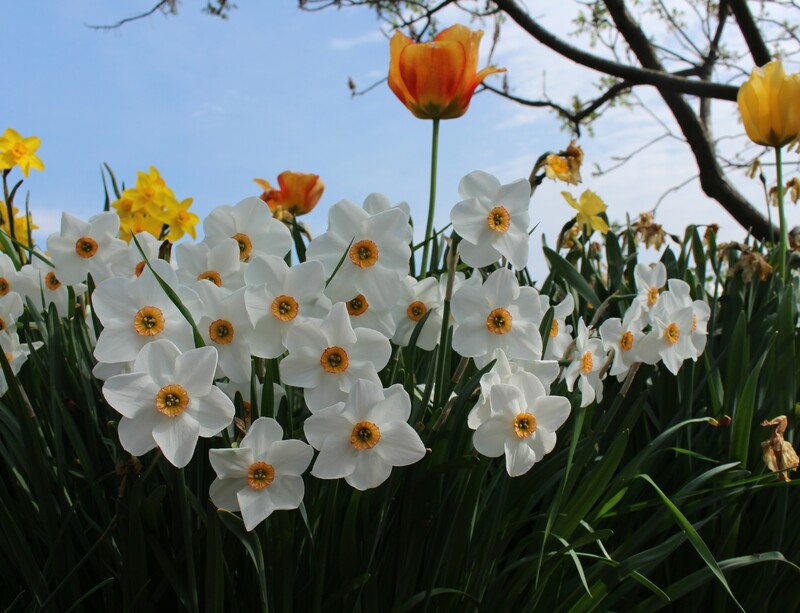 Daffodil shows or not, one thing I definitely need to still consider is the call for adoptive parents for the many extras which fill the bulb beds. 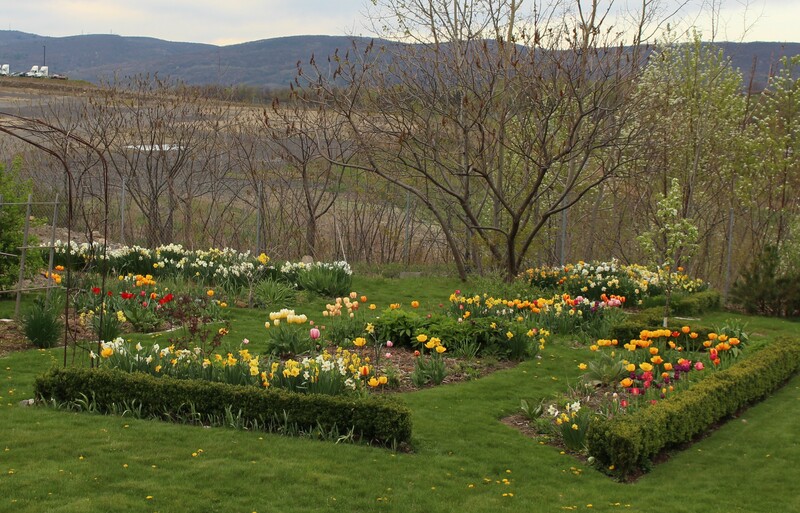 The beds are packed and I need to get rid of hundreds of bulbs from old favorites to heirlooms to newer varieties. Please leave a comment if you’re interested in any, all it takes is the price of postage. Please. Now I really can’t justify the next flower. Double tulips are gross wads of colorful tissue paper stuck onto the ends of pipe cleaners and pen ends. Completely lacking in class and of course just what I need more of. A few years ago I planted a ‘Magic Carpet Mix’ of double tulips and I’ve been digging them each summer and moving them around trying to find just the right spot for them. I’ll let you know if I ever succeed. I admit I do like tulip monstrosities. The singles are so plain and elegant it’s nearly unstable of me to want anything else, but I do, and I know next year will see a few more doubles and probably a few of the twisted and distorted parrots as well. 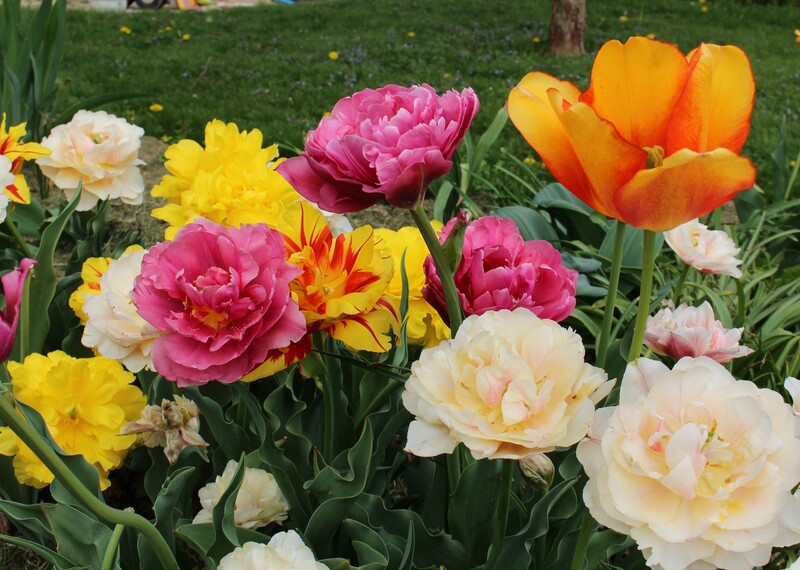 I think the only oddities I don’t like are the fringed tulips. It’s probably good to draw the line somewhere. More ‘Magic Carpet mix” double tulips. The taller pink and blush flowers make excellent cut flowers btw. 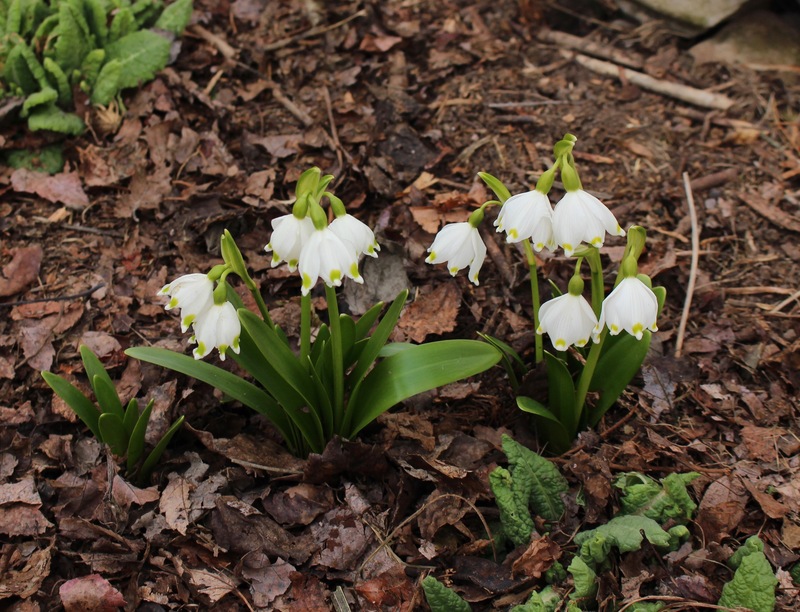 It’s not all bulbs here, there are a few other treasures here as well putting on a nice show. As this is my 9th spring here I’m starting to wonder where all the billions of seedlings I start each spring go. I kill thousands, and another million are annuals, but here and there I’m starting to see a few nice perennials joining my garden. Not as many as you might hope for or expect, but it’s still a fun trip. One group of seed-grown plants which is almost a problem now (since I keep starting more and more each spring) are the primroses. 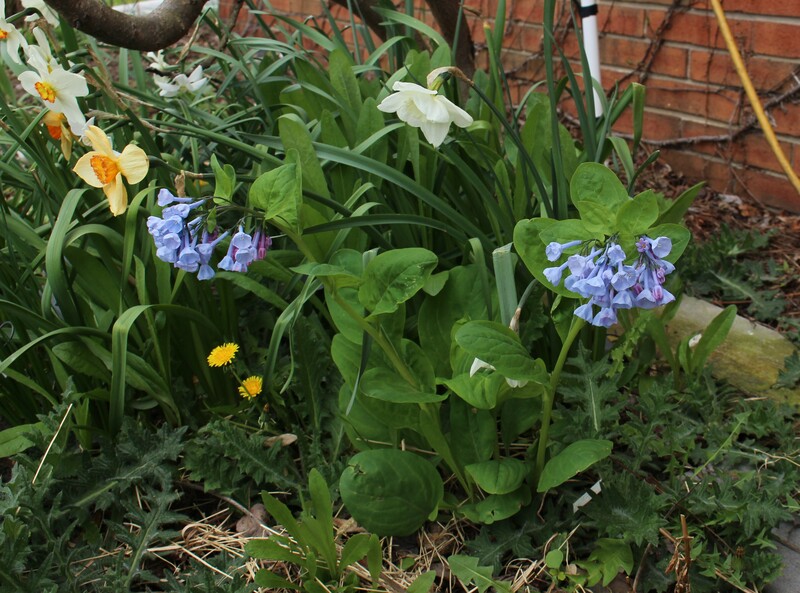 A few of the tougher types such as the polyanthus and veris (cowslips?) types are building up decent clumps, but I’m still pretty sure they just tolerate my garden and aren’t really that thrilled to be here. 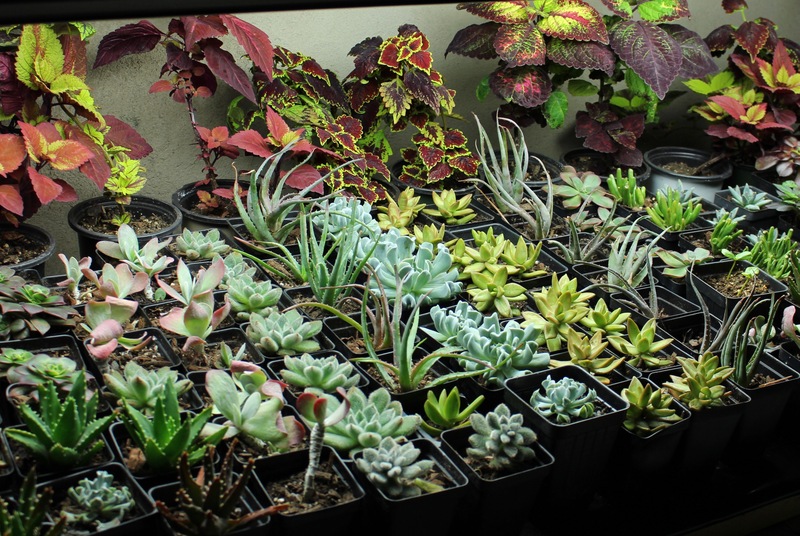 I’ll take what I get though and for now they’re worth the extra trouble of watering. 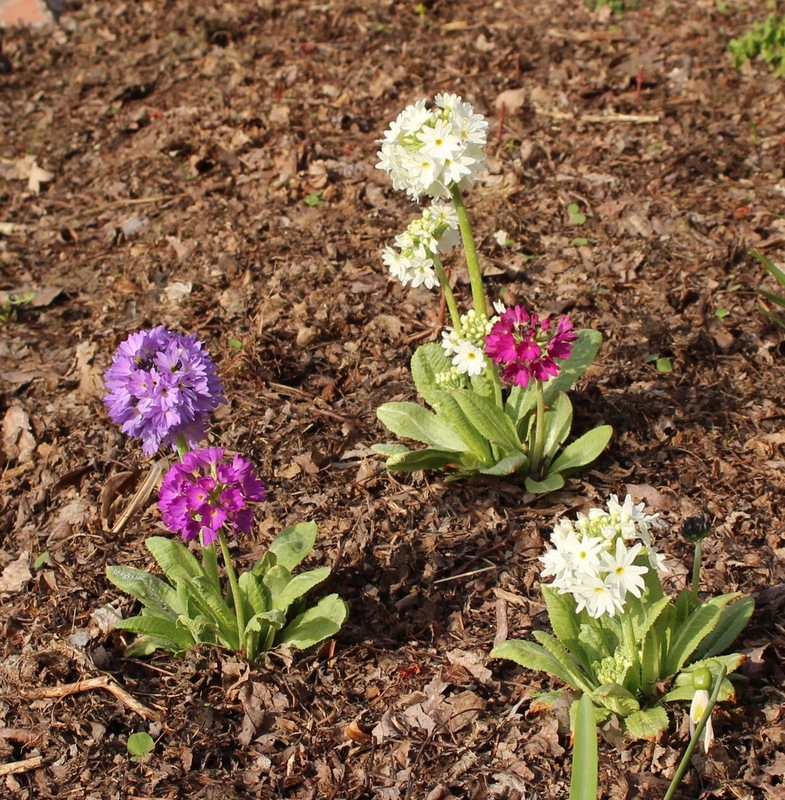 Seed grown primula from the American Primrose Society seed exchange. Although most of the other types (mostly the p. aucalis and wanda types which usually show up at groceries in the spring) die off during the summer, but eventually I hope to find a few others which aren’t too much trouble. Granted “too much trouble” is a very relative term if it’s something you really, really, really need to grow! 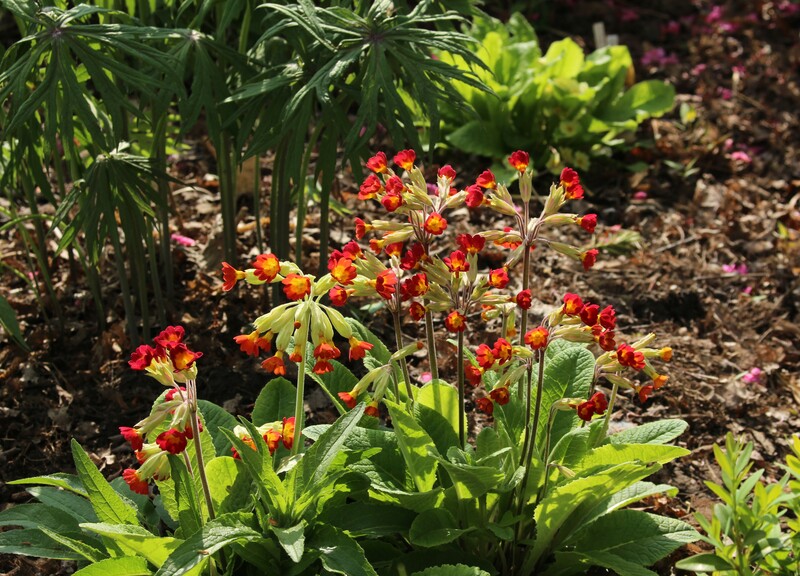 More primula from seed, these are probably ‘Sunset shades’, a cowslip (p. veris) strain. 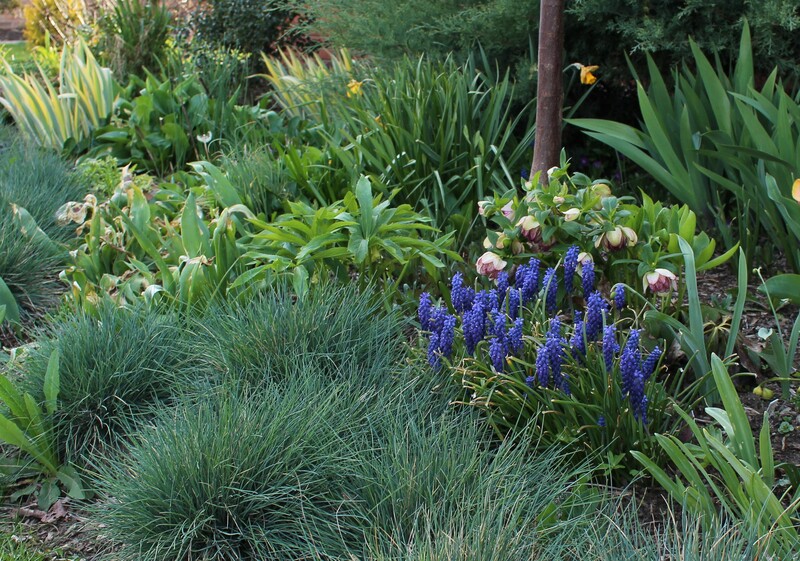 The foundation bed with blue camassia and (in my opinion) a very nice blend of foliage colors and textures. More tulips. The “Incendiary Collection” from Scheepers is flowering in the newest section of the front street border and I’m more than pleased with it. The mix is a blend of three colors but even for the gardener who planted them it looks like a mix of two unless one looks really hard. No problem though, all I notice is the bunches of perfect color and the…. well really, the tulips are the only thing I notice. A $40 splurge on 80 bulbs. They weren’t even on sale and if I were the introspective type I’d wonder why I bought them and how I rationalized it after saying earlier “no new tulips this fall”. Actually I did notice one other thing. Still tulips, but they’re a much shorter and more subtle version of the group. It’s tulip “Green River” and they’ve come back nicely for a second year. Tulip ‘Green River’. I’d call this an orange sherbert color and although it’s not as showy as the others I still think they’re cool. 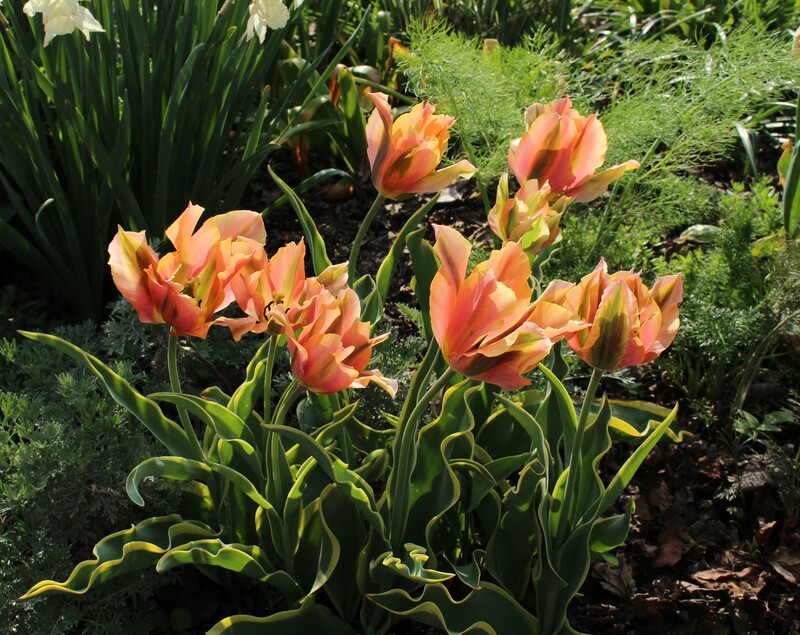 Don’t overlook the variegated foliage, it’s another subtle touch on a pretty little tulip. Spring is moving fast so it’s really best to soak these things in while you can, and believe me I’m trying. The house has a ton of projects which should be getting done but whatever. 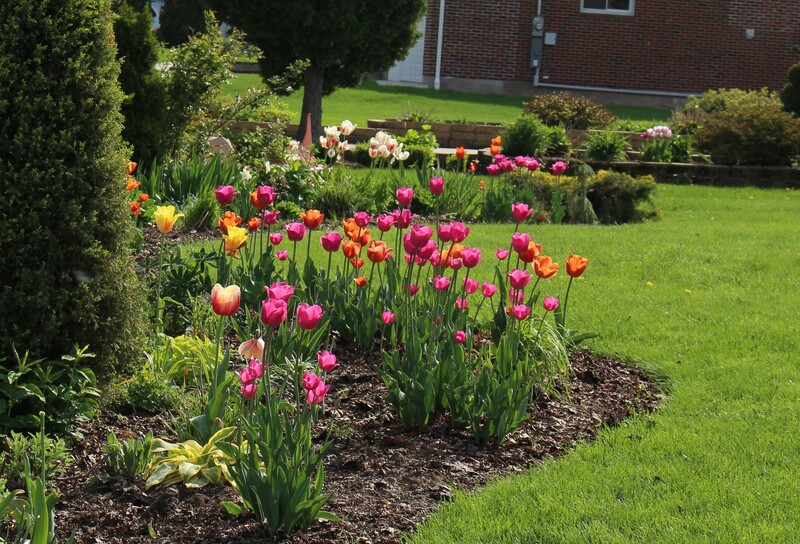 I’ll leave you with a parting glimpse of the front yard tulipomania. 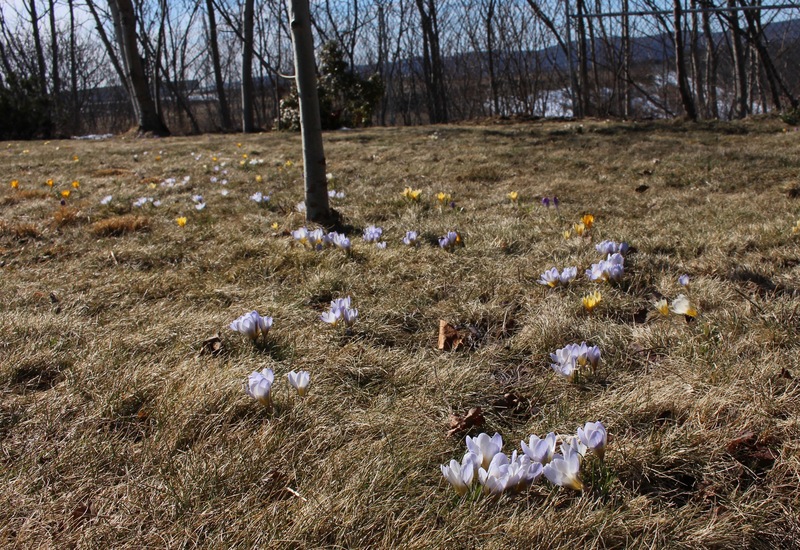 Bright flowers, green grass, and springtime sunshine. Hope spring is going great for you as well. Have a wonderful weekend! The title says it all. Nearly all the snow has melted, jackets were thrown aside, and for a glorious weekend we enjoyed obscenely nice spring temperatures and sunshine. 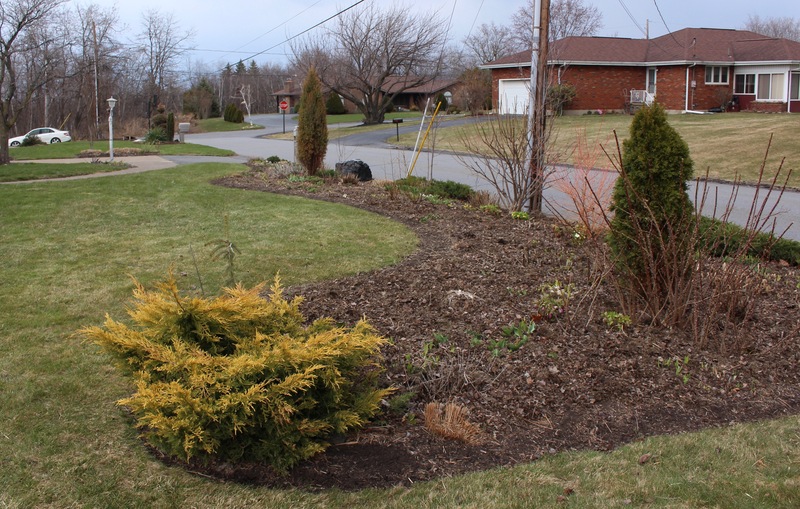 I didn’t even do the responsible thing and wash the car first, I went straight for the clippers and rake and tidied winter away from the front yard. 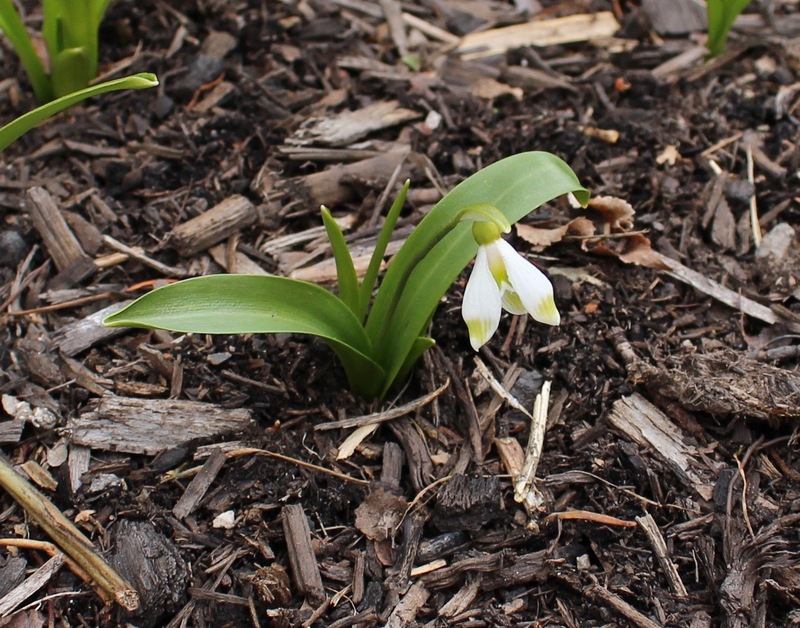 With flowers bursting up out of the soil it was the only logical thing to do. I’m not one to hem and haw about “is it too early” or “can I uncovered the perennials yet”, I just dive right in as soon as the weather gives me the chance. Sure it will probably get cold again, but I find that covered or not they’re going to start growing anyway. 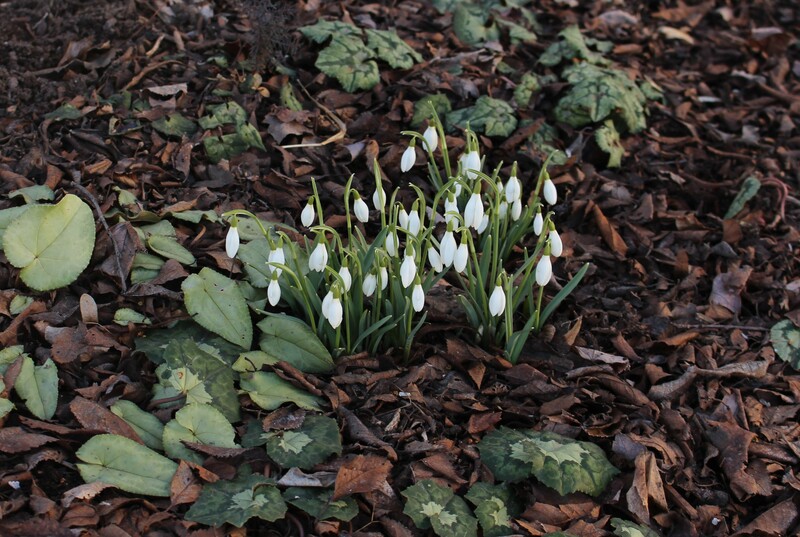 The earliest of the common snowdrops (Galanthus nivalis) came up completely as the snow melted Saturday. 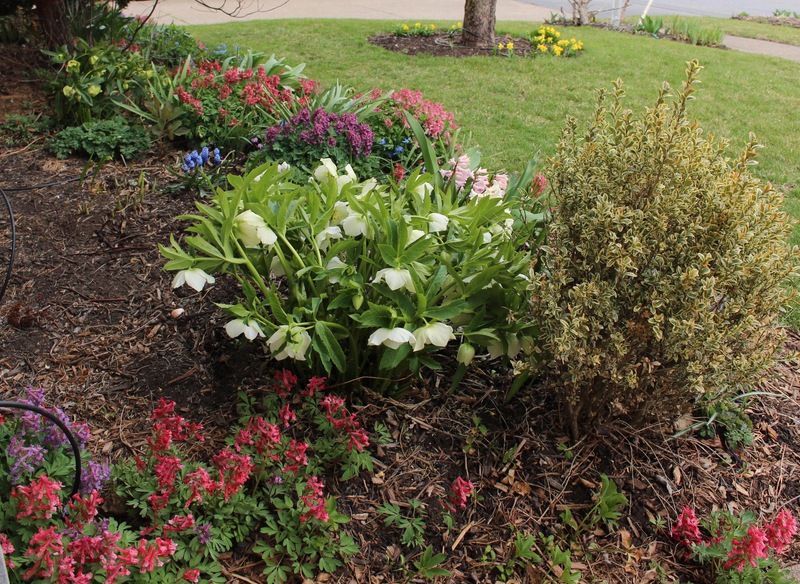 I think they look even nicer coming up amongst a nice groundcover of hardy cyclamen. 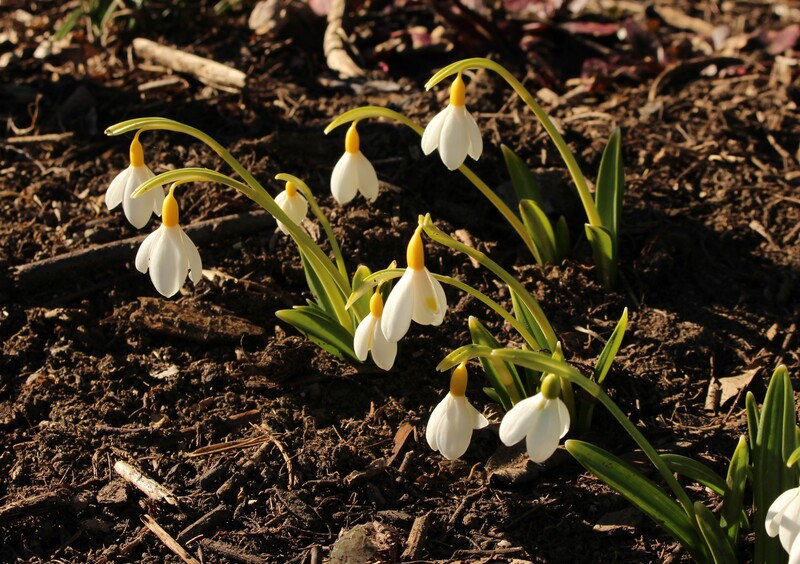 ‘Wendy’s Gold’ is one of the “yellow” snowdrops. The color is exceptional this year, and just as bright as today’s sunshine. 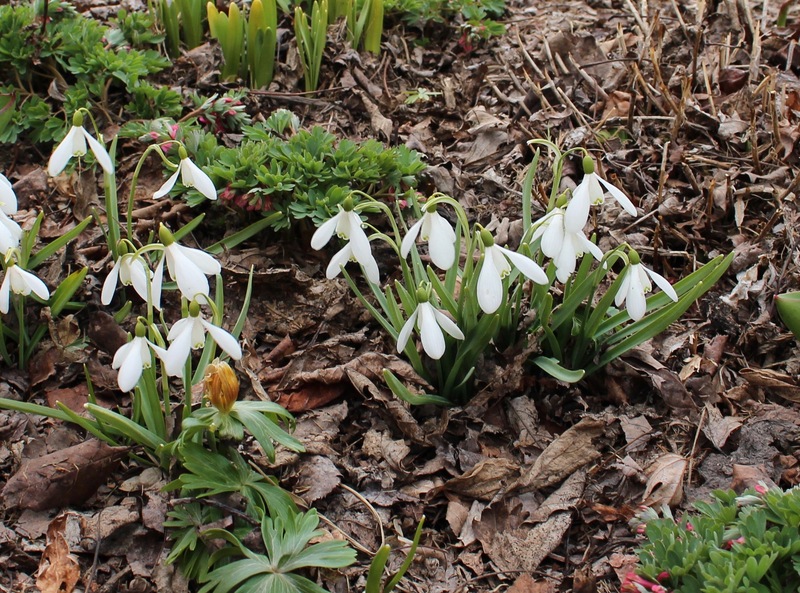 After a downright miserable snowdrop season last year, this year (all three days of it so far) is shaping up to be outstanding. 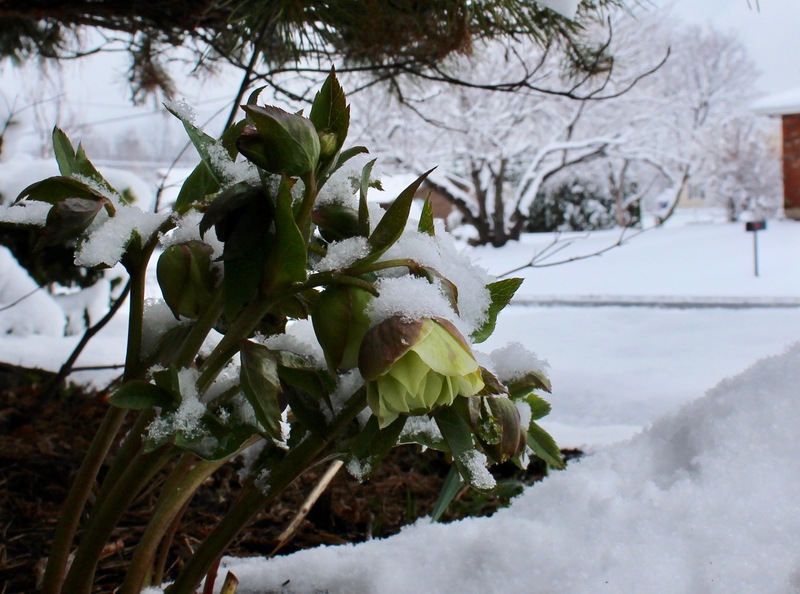 With the usual optimism of a gardener I’m positive that last year’s arctic blasts and heat waves, combined with downpours and hail, will not repeat. I see nothing but idyllic temperatures and sunshine, even though it is about a month early. But just in case, I’ll keep watering the winter garden since it’s coming along as well. 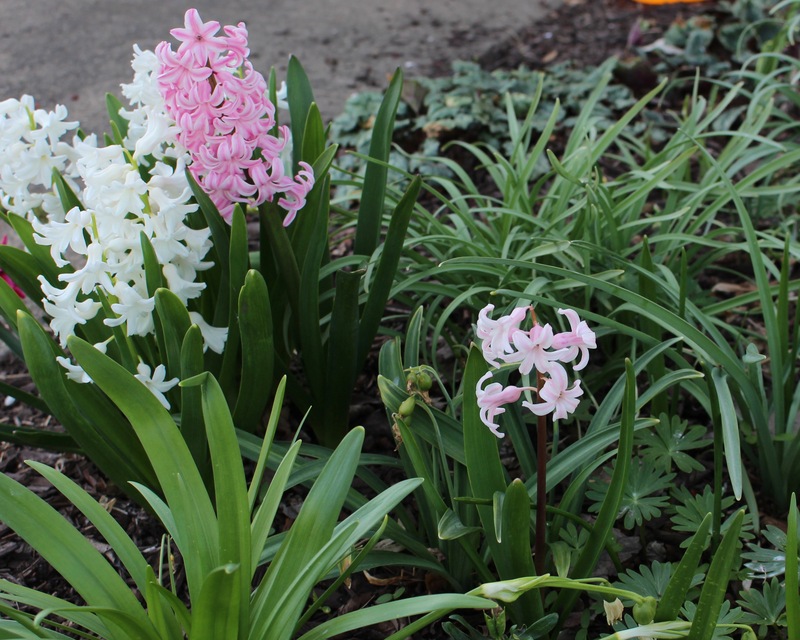 A few of the hyacinths I forced this winter. Not bad for a bunch of clearance bulbs. 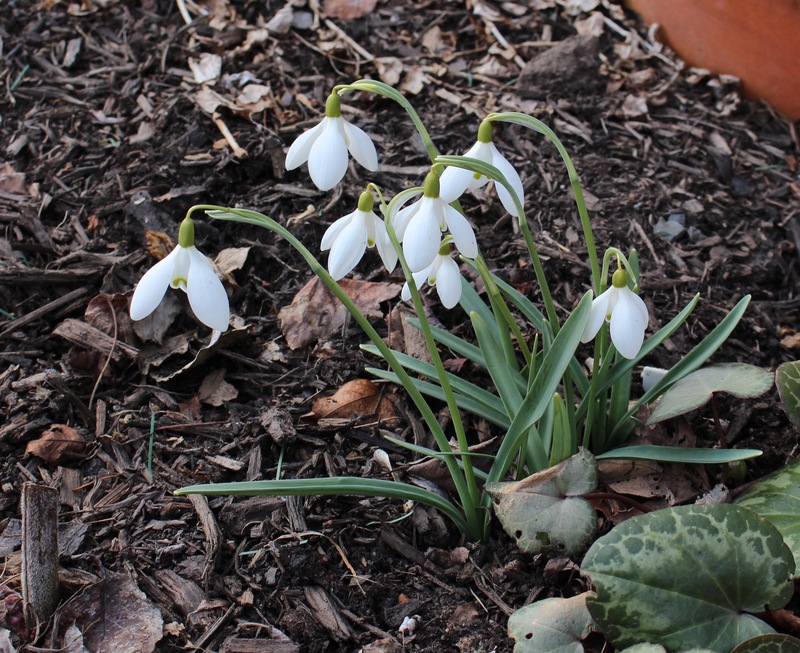 The indoor snowdrops are mostly over, but the cyclamen are going strong and the primrose are promising a nice show as they send up flower buds. 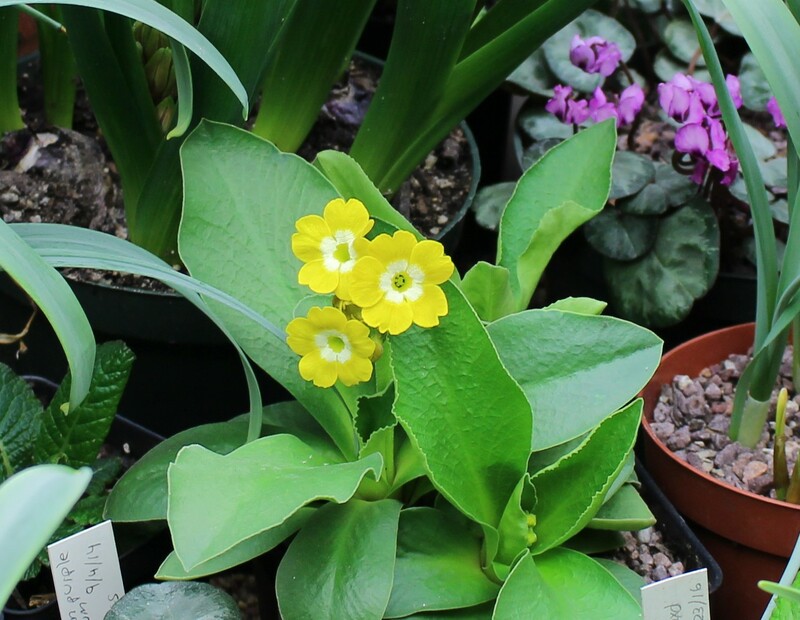 Miraculously I’ve managed to see my Primula auricula through the winter and bring it back into flower again under the lights. I managed to grow this from seed (somehow) and I’m afraid it’s literally led me down a primrose path to membership in the American Primrose Society. Now for a third year in a row I’ve ordered more seed and just in case you’re brave enough, the society has just opened up this seed exchange to non members. 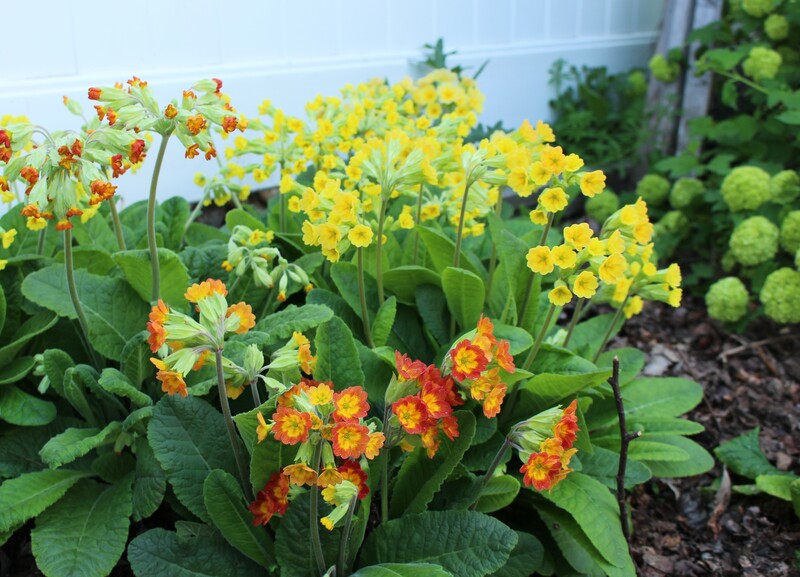 Click here for a link to some of the best (and cheapest) primula seed available in the US. Definitely not the fanciest example of an auricula primrose, but it’s my very own (and most importantly I haven’t killed it yet). The fancier versions come in rich reds, blues or greens with larger flowers, bicolor blooms… all with that cool white-powdered center. I’m excited again about the primroses, but Cyclamen coum are still a favorite. 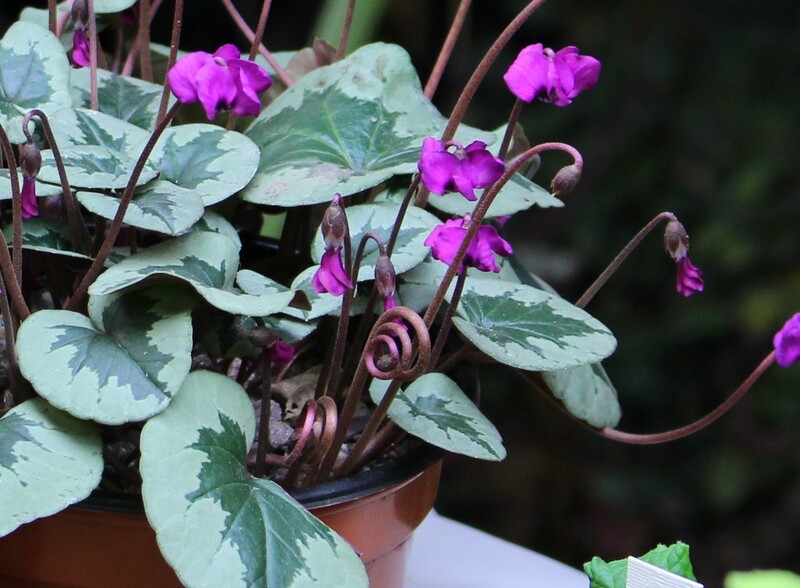 Their numbers have dropped a little due to someone not being the most capable cyclamen grower, but I have plans to turn that trend around. I’ve been going and dabbing pollen from flower to flower in the hopes of getting a few seeds to form, and if all works as planned there will be a new batch of these coming along in no time. 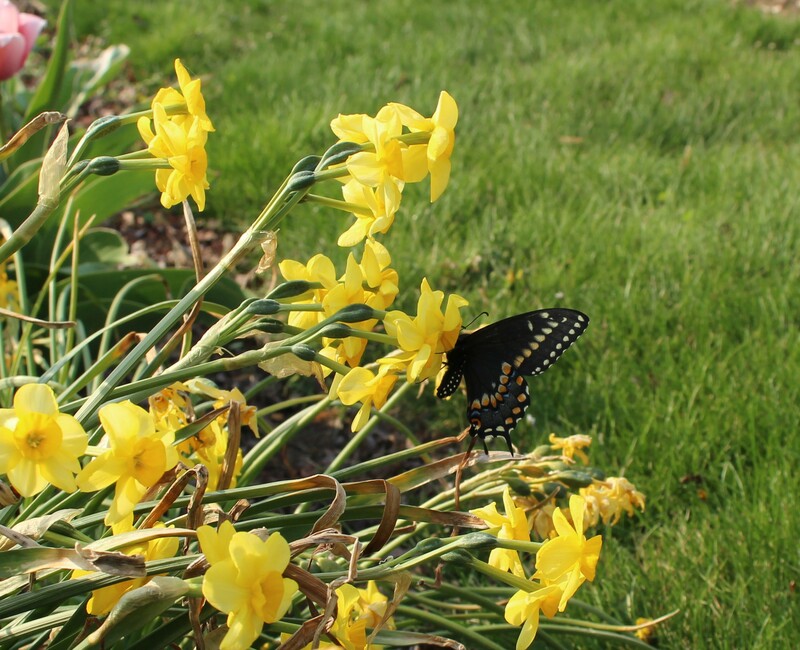 Unpollinated flowers will wilt and fall over, pollinated flowers will curl up and tuck themselves down close to the ground to form a seed pod. 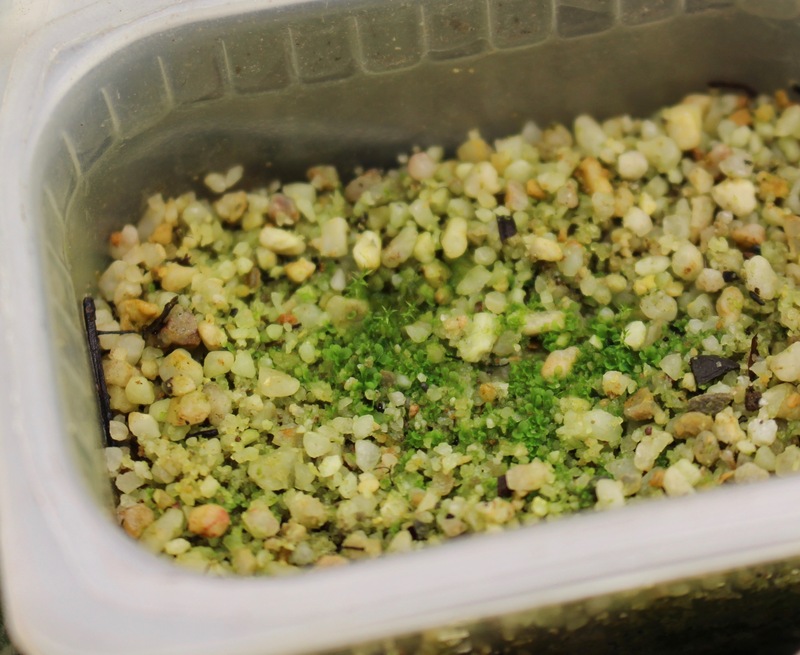 I think this is one of the most curious traits of these little plants. As the cyclamen set their seeds and the other flowers join the show I’ve decided to bring a few of the forced tulip bulbs under the lights to see what they can do. Tulips indoors are a first for me, but with the way our weather’s going the ones outside will be nearly open anyway so it’s no great loss if failure strikes. 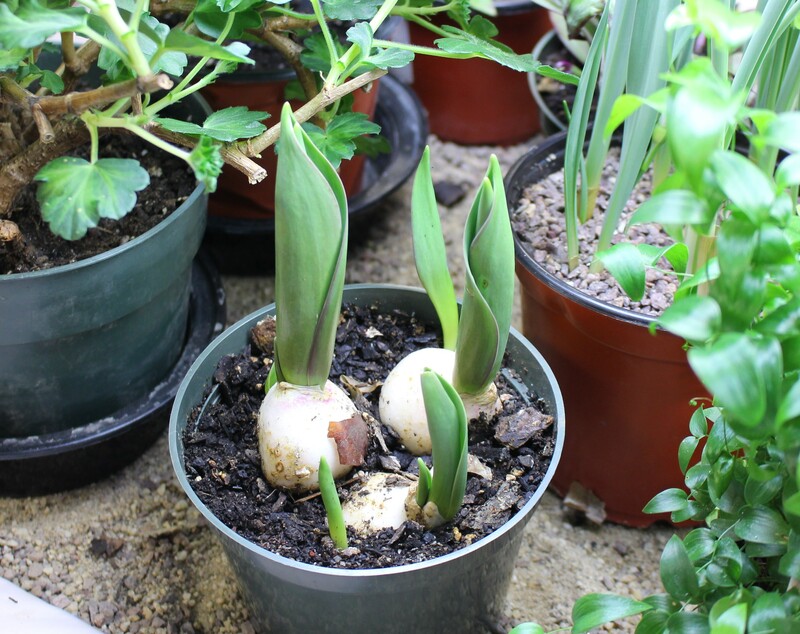 In typical fashion bulbs have been carelessly stuffed into a too small pot, and although I don’t anticipate any overwhelming demand for this less than attractive photo, in my opinion it looks extremely promising. And we will see where this season takes us. It’s a freakishly early start to spring but even in a normal year there’s plenty of unfortunate weather to go around, so a beautifully warm weekend in February isn’t the worst thing. I guess we will just have to enjoy it while we can, and of course I’m fine with that. Imagine my embarrassment when I saw it’s been nearly two weeks since my last post. I know the exact reason for the pause but right now just don’t want to get into the ugly truths about mixing brutal cold fronts with fresh spring growth. 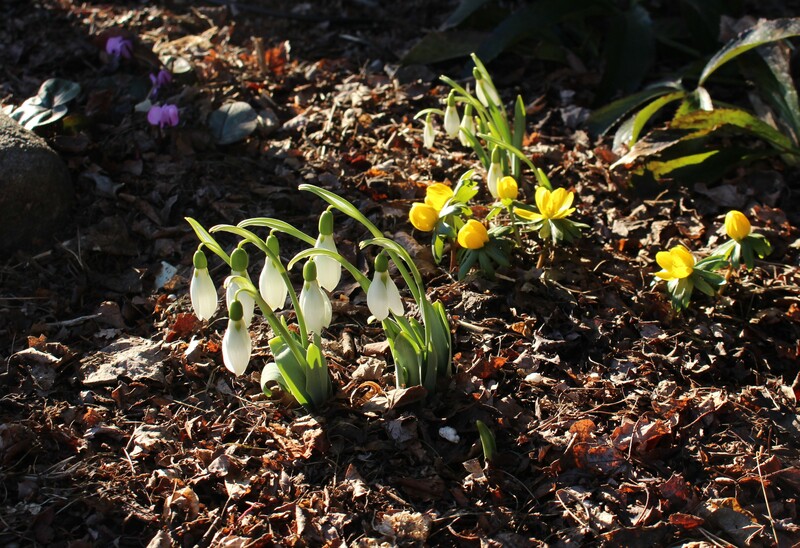 Instead I’ll focus on the beautiful sunshine of a cool spring morning and join in for a very quick visit to celebrate Garden Bloggers Foliage Day with Christina from ‘Creating my own garden of the Hesperides’. 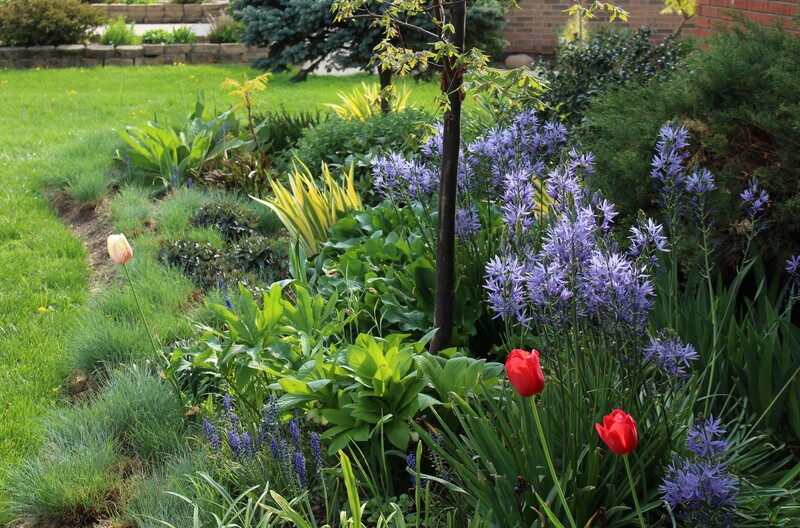 Thanks to Christina for the monthly reminder to reexamine the contributions foliage makes to the overall look and feel of the garden, and this month it’s a border of blue fescue which has me most pleased with foliage effect. 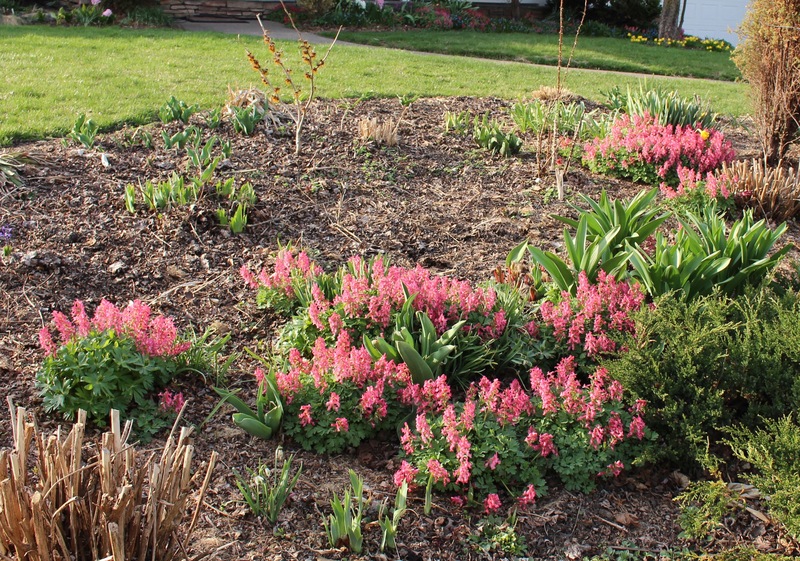 This border was switched up last spring when I divided and spread a few clumps all along the foundation plantings, and this spring it has filled in with a lush vigor which really shows off the bed. 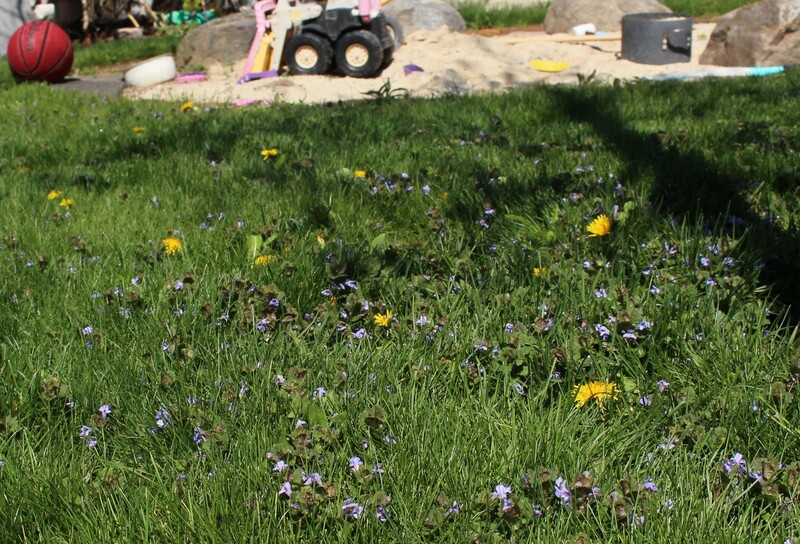 Now that the fescue is making me happy I’m fixated on a clump of blue muscari growing just behind the grass clumps. There’s a strong possibility this will be divided and spread along as well since I like the combination. See? I promised it would be quick. 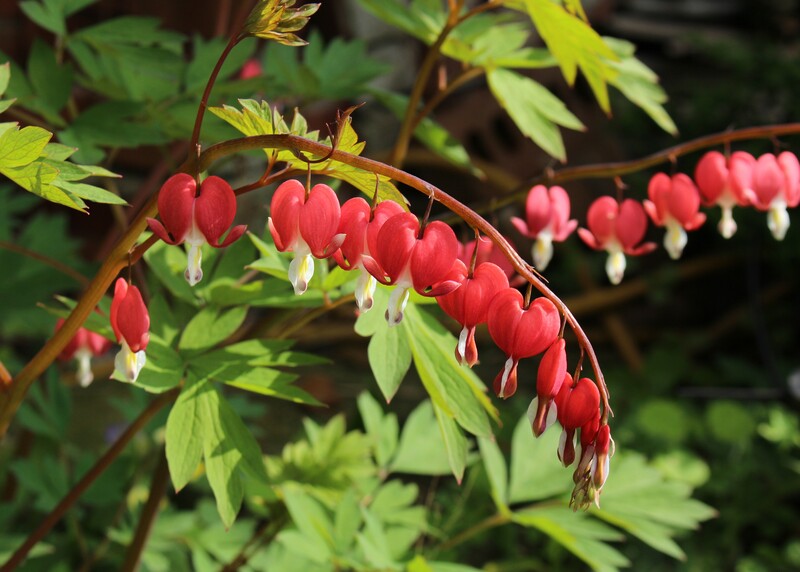 Please visit Christina’s blog as well, it’s always a pleasure to see and hear about the foliage others across the globe are enjoying in their own gardens, and have a great weekend!